The study, from Eptica, found that failing to understand emails and tweets and consequently not answering their questions is the biggest consumer frustration when it comes to digital channels in both the UK and France. Nearly a third (31%) said that failure to acknowledge upset or anger was a major issue. · In France 63% of consumers listed unpersonalised responses, partial answers or replies that failed to help as their number one issue. · Email is the digital channel of choice for consumers looking to contact brands. 87% of Britons (and 83% of the French) use email as the primary means of communication, way ahead of Twitter and Facebook. The research, carried out internationally, found that 78% of UK consumers ranked getting a response that either partially, or completely, failed to answer their question in their top two biggest frustrations. In France 63% of consumers listed unpersonalised responses, partial answers or replies that failed to help as their number one issue. Waiting a long time for an answer was highlighted by 38% of French consumers as their biggest frustration. On both sides of the English Channel, customers are increasingly happy to switch suppliers after poor experiences. 82% of British consumers said they always or often switched supplier if they failed to correct their mistakes, slightly behind French consumers (83%). Of these 55% of the French, and 41% of British, consumers said that they would stay provided that their issue was sorted out quickly and they received an apology/compensation. The Eptica Study: Consumers vs. 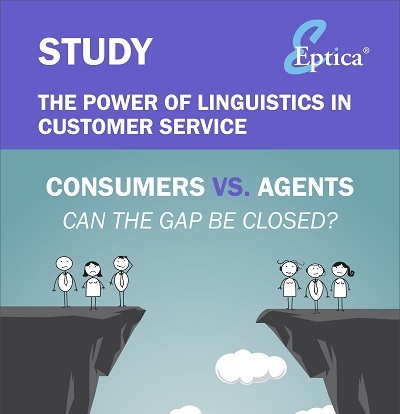 Agents: Can the Gap be closed?, which surveyed both consumers and contact centre agents in France and the UK, highlighted a growing understanding gap between the two sides when it came to customer experience. 71% of British agents listed understanding the language and vocabulary that consumers used in their top two frustrations, as did 54% of French agents. Nearly a third (32% in the UK, 31% in France) found it hard to recognise anger or upset in written communications. Agents see there is a growing problem, but feel powerless to help. 71% of British contact centre agents believe that the number one customer frustration was receiving inadequate or partial answers, a concern echoed by 49% of French agents. 85% of UK agents thought consumers would be likely to switch if they received poor service, although just 78% of French agents agreed. Consumers overwhelmingly now use email to contact brands, with 87% of UK consumers (and 83% of the French) selecting it as their primary communication channel. This growth in digital channels is widening the understanding gap, as text-based communications are fundamentally more difficult to understand than face to face or voice-based channels as they lack context or visual/verbal clues. This adds to the challenge of dealing with an expanding number of digital enquiries from increasingly impatient consumers. When asked what would help them work more productively and give them better insight and understanding, agents in both countries want improved technology. Over half (53%) of French agents, and 51% of UK ones, listed technology that analyses questions and suggests relevant information as their 1st or 2nd choice. The ability to prioritise answers based on tone was specified as a priority by around half of agents (50% in the UK and 49% in France). Finally, agents wanted better, centralised knowledge bases that provided faster access to more consistent answers, with this choice selected by 34% of British, and 39% of French agents. The Eptica Study: Consumers vs. Agents: Can the Gap be closed? combined research with consumers and contact centre agents in both the UK and France. 2,000 consumers and 232 contact centre agents, half in each country, were surveyed online in H1 2015. The full findings of the research along with recommendations for areas to focus on, are available in the Consumers vs. Agents: Can the Gap be Closed? management report which can be downloaded from http://www.eptica.com/power-linguistics.